O’Faolain, Nuala. My Dream of You. Read by Dearbhla Molloy. Hampton, NH: BBC Audiobooks America, 2002. Reason read: September is supposedly the best month to visit Ireland. Irish born Kathleen De Burca has arrived at a crossroads in her life. Nearing fifty she loses her best friend and coworker to a heart attack. As a travel writer, Kathleen has lived in London for nearly thirty years and has never married or had children. Jimmy was the closest person she could call family. But, when she is presented with the lifetime achievement award she was supposed to share with her best friend she realizes there is more to life than travel miles and exotic venues. Why not go home to Ireland? Why not research a century old crime that has long fascinated her? So begins Kathleen’s story. Her past is as complicated as her future is a blank slate. Giving up everything, she lays herself bare to the tragedies of the past; remembrances of long ago transgressions; all the cringe-worthy scars of yesterday. But, as she says on page 408, “Tragedies end.” And so they do. Kathleen learns to pick up the pieces and face the black slate of tomorrow with a different kind of courage than it took in order to come home. As an aside, I felt the ending gave O’Faolain room for a sequel. Just saying. Quotes I fell in love with, “I envied her both the Alzheimer’s and the caring husband until I realized that if she had the one she didn’t know she had the other” (p 410), “Happiness keeps you poised, and you do the right thing without effort, whereas you get things wrong when you’re struggling with lack of life” (p 438), and “Either take account of other people from now on, or go back to the bad old days” (p 484). On a personal note, I took a lot from Kathleen’s words. I, too, am a woman who has repeatedly shunned the thrum of humanity, preferring my own seclusions. I, too, need to embrace and take stock of others around me. Author fact: O’Faolain also wrote a best selling memoir about her life as an Irish woman. Book trivia: My Dream of You is O’Faolain’s first novel. Narrator fact: Dearbhla Molloy won an Audio Award for the abridged narration of My Dream of You. Nancy said: My Dream of You is “a good novel set in Ireland” (p 126). She also said it is a first novel she was “delighted to have read” (p 89). BookLust Twist: from Book Lust twice. First, in the chapter called “First Novels” (p 88) and again in “Irish Fiction” (p 125). Also, in Book Lust To Go in the chapter appropriately called “Ireland: Beyond Joyce, Behan, Beckett and Synge” (p 111). Madden, Deirdre. One By One in the Darkness. London: Faber and Faber, 2003. Three sisters have gathered at their childhood home in Northern Ireland for a visit. Cate, a journalist for a home/fashion magazine in London, is early for her annual visit; a detail that is not lost on older sister, Helen. Helen, a solicitor in Belfast, comes home every weekend, and Sally, the youngest and a teacher, already lives at home with their mother. None of the sisters are married. The story bounces between present day and the three sisters’s childhood in alternating chapters. Madden uses clever clues like the spelling of Cate/Kate to indicate past or present. When Kate became an adult she changed her name to Cate. So for chapters in the past it is Kate while for present-day chapters it is Cate. [As an aside, it reminded me of the movie ‘Sliding Doors.’ In one scenario Helen has cut her hair short and dyed in blonde while in another she leaves it long and dark. The difference helps the viewer tell the difference between the two story lines involving the same character.] Cate, Helen and Sally grew up in the 1960s and 70s during the Troubles and it’s this historical background that drives the present day story of the mid 1990s and the IRA ceasefire. There isn’t a plot to speak of, just the coping of four women after the death of the head of the household during the troubles. The only present day drama worth noting is Cate’s pregnancy. Line I liked, “But she gained a dark knowledge that night which would never leave her” (p 130). Reason read: I have read it somewhere that October is the best time to visit Ireland. Book trivia: One By One in the Darkness was nominated for the Women’s Prize for Fiction in 1997. Author fact: Madden won the Rooney Prize for Irish Literature in 1987. The conditions of the prize? Write Irish lit (obviously) and be under 40 years of age. Interesting. BookLust Twist: from Book Lust in the chapter simply called “Irish Fiction” (p 126). Llywelyn, Morgan. 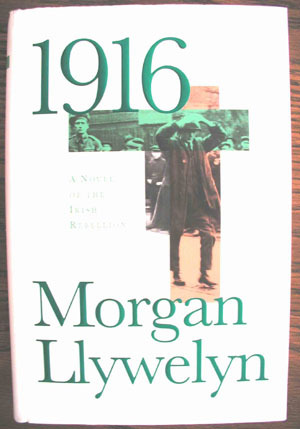 1916: A Novel of the Irish Rebellion. New York:Tom Doherty Assoc., Inc., 1998. It should tell you something that I read this book in less than two weeks. What it should tell you I’m not exactly sure. I did enjoy myself, though. I think, for starters, it’s about a country I long to visit, a country I have heard much about. I also think this was a clever tale. The truth wrapped in fiction or is it fiction wrapped in the truth? Right off the bat the story is intriguing. Our hero, Edward “Ned” Halloran survives the sinking of the Titanic. His survival is “lucky” because as a citizen of Clare County, Ireland he should have been in steerage with the other third-class Irish. The only reason why he and his family were in second class is because their passage was arranged by Ned’s sister’s fiancee, a White Star employee. The family was going to her wedding in New York City. After the tragedy, once back in Ireland, a series of events allows Ned to get involved with a group of men calling themselves the Irish Republic. It’s history from here on out. The struggle for Irish independence is painful and poetic. “It’s the only place my skin fits me.” (p 201) My husband will tell you that sounds like Monhegan…. Weber, Katharine. The Music Lesson. I picked up Weber’s second novel after reading her debut novel Objects in the Mirror Are Closer Than They Appear. In Objects I fell in love with the narration immediately. The writing was so fluid I hoped everything Weber wrote would read the same way. I liken Music Lesson to that of a second kiss. It’s not as good as the very first one yet still highly enjoyable. When I found out it was part of the Book Lust Challenge I almost put it on my “must reread” list because I liked it so much. It’s the story of Patricia. She guards a stolen painting in a cottage in Ireland. Alone. Alone with her troubled past and complicated future, Patricia has time to contemplate the crossroads. The stolen painting becomes more than just “art” to her. It guides her through a metamorphism and an awakening. BookLust Twist: From Book Lust under the heading of “Irish Fiction” (p126). To learn more about one of my favorite authors, Katharine Weber, go here.